Wash the Rice & dhal . In a pressure cooker or pan, add ginger,salt,water, milk,curry leaves & salt. Simmer in slow flame upto 3 to 4 whistle. Heat ghee in kadai,add cumin seed,pepper corn,curry leaves,cashewnut saute few mins & add to the pongal& mix well. Serve with sambar or chutneys. 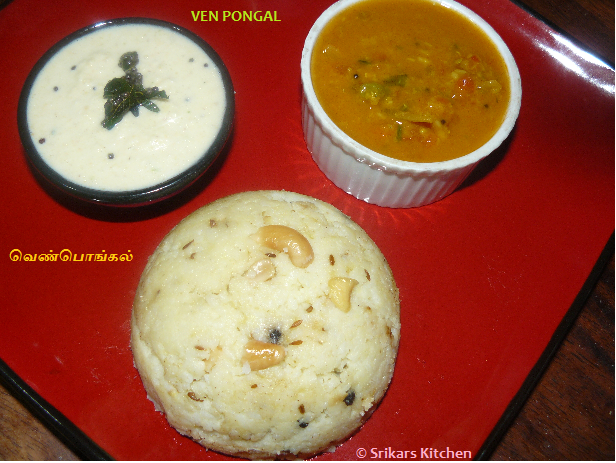 Your Pongal looks perfect Sri...Very much like Sarvana Bhavan serves here. Doesn't the milk curdle when you add it along with everything else to the pressure cooker? pongal looks yummy yum. its a perfect southindian breakfast. UR HUBBY ORKS IN CHISICK? I like pongal.Pongal looks yumm &perfect..
Pongal looks real nice ..